The proposal to retool Ninth Street in Park Slope and include bike lanes is still causing tempers to flare. We watched a long discussion of the issue at a meeting of the Park Slope Civic Council on Thursday night, which was marked by some surprising outbursts of anger. (Surprising in the sense that we would never have predicted that bike lanes could provoke so much upset.) One members of the Civic Council, in fact, privately remarked that the bike lane issue--which has now been debated twice by the group--has led to the most contentious meetings they have experienced, including discussions of Atlantic Yards. An earlier meeting on the issue was also marked by strong disagreements as was a Community Board 6 meeting. The Department of Transportation turned down an invitation to make a presentation to the group about the plan. It is scheduled to speak to Community Board 6's Transportation Committee about it on May 17. "There is a lot of concern and anxiety in the community over this plan," noted PSCC Trustee Aaron Naparstek, who edits and writes Streets Blog and advocates for progressive transportation policies citywide. Mr. Naparstek made a detailed presentation about the plan, explaining current safety problems and how the proposed changes--adding bike lanes in each direction, eliminating a lane of traffic each way and installing left turn lanes--would reduce accidents and improve pedestrian safety. He was interrupted several times by shouted comments from opponents of the plan. In transportation planning terms, the changes would put Ninth Street on a "Road Diet" and lead to a safer street. "I don't see this as a thought-out plan," said Robert Levine, who is PSCC Trustee and heads the Ninth Street Block Association. 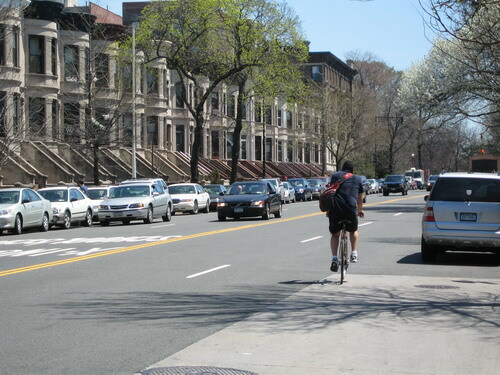 Mr. Levine has led opposition to the bike lane proposal in Park Slope. "We're adding bikers to the mess of traffic on Ninth Street." He suggested that that bike lanes will make it hard to double park on Ninth Street and will lead bicyclists to use a park entrance at Ninth Street intended for pedestrians. He also said that it would increase congestion on the street. Supporters say that the plan will lead to a dramatic reduction in accidents and make Ninth Street safer for pedestrians while adding an amenity for bicyclists in the neighborhood. The Department of Transportation has already indicated its intention to go ahead with the plan by summer. I have so much trouble understanding why someone would be against a bike lane on a street where drivers are constantly endangering pedestrians and cyclists. I have ridden my bike down 9th Street by necessity in the past, and I always regret it. Getting pushed off the road by a dump truck is no fun. The only conclusion I can come to is that Mr. Levine hates people, and doesn't mind the occasional pedestrian fatality. Bike lanes make me angry too. Where is Gowanus? Should I consult an Anatomy book? The entire "controversy" is being stirred up by one guy, Robert Levine. He is a completely irrational player and an intensely selfish and shortsighted little man. DOT will go forward with the plan and the biggest beneficiaries will be these car and brownstone owning NIMBY's above 7th Avenue who call themselves the 9th Street Block Association.